Summary: Need to clear Spotlight Search on iPhone? You've been the exact place. After reading through the passage, you will know how easy it is to delete iPhone Spotlight Search and free up as much space on your device! Spotlight Search is a helpful tool which can help iPhone/iPad/iPod users to search the wanted files more quickly. But sometimes it can contain some personal information that you don't want them to show on your screen. Therefore, to protect the privacy, it is necessary for you to remove particular Spotlight Search items. However, how to clear Spotlight Search on iPhone easily? This article is going to show you the solutions to delete Spotlight Search on iPhone X, 8, 8 Plus or 7. 1. How to Clean Spotlight Search from iPhone X/8/8 Plus/7 Plus/7/6S? Step 1: Press the top power button on your iPhone. Wait for the device to boot up and show the lock screen. Move the slider switch from left to right to unlock the device. Step 2: Tap to open your iPhone's "Settings" menu which launches the iPhone's settings control panel. Step 3: Go to the "General" section and tap the "Spotlight Search" option. You can now add or remove the type of items the spotlight search will index on your phone. Step 4: Tap an item to check or uncheck it from the search list. A checked item will be unchecked when you tap it and vice versa. If you would like to fully disable the spotlight search feature, then uncheck every item on the search list. Step 5: Press the "Home" button when you are finished to return to your home screen. 2. How to Reset All Settings to Delete iPhone Spotlight Search? Another way to erase Spotlight Search on iPhone directly is to reset all settings on the device. Compared with the first means, this method would be more powerful and thorough. But meanwhile, you will lose all your files after the reset since it will wipe all the data and settings on your iPhone. This will effectively prevent your personal information from revealing and free up the phone space but you should remember to make a backup for the desired files. Then you can start to reset the settings on your iPhone. Step 1: Tap on the "Settings" icon on Home screen. After entering the application, you should continue to select the option "General". Step 2: In this section, you can click on the "Reset" option and then the reset menu will be listed on the interface. 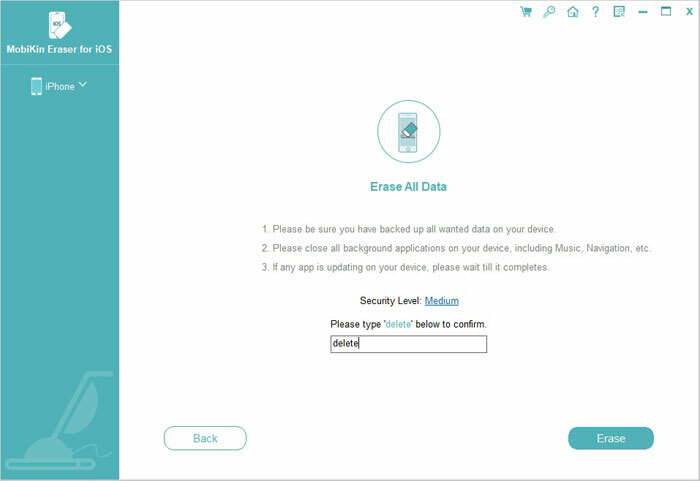 Step 3: Now you need to select "Erase All Content and Settings" and then you will be asked to enter the passcode. Just type in the code correctly and tap on "Erase iPhone" to start the resetting process. 3. How to Erase Spotlight Search History on iPhone Permanently? Well, with the above methods, clearing Spotlight Search history can be managed, but what if you want to erase the Spotlight Search history permanently and securely? No worries. An all-around iPhone cleaner tool is kindly recommended here - iOS Data Eraser. It is a third-party desktop app which can help you erase everything on iPhone with zero opportunity to restore and clear the junk files you don't want anymore. Now you can download a free trial version on your computer and follow the instruction below. 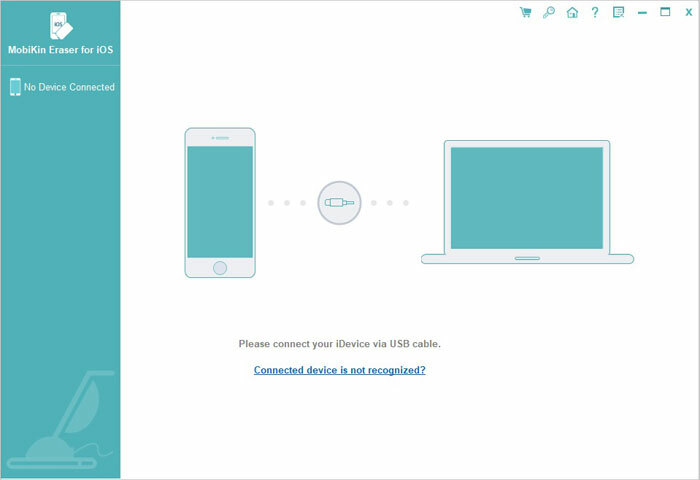 Step 1: After installing the software on your computer, you can launch it and connect iPhone to computer via a USB cable. On the main interface, you can select different modes to erase unwanted files on your iPhone. To delete Spotlight Search history permanently, please select the "Erase Private Data" mode to continue. Step 2: Then you might get all the private data on your iPhone. Visit the "Safari History file" folder or "Spotlight Search history" file folder. Then you can select the unwanted files according to your need. Step 3: After selecting, you can hit the "Erase Now" button and then type "delete" on the pop-up window to confirm your action and begin to erase all selected items in one click. After the removing process, your Spotlight Search should be safer, and you will be able to continue using your iPhone X/8 Plus/8/7 Plus/6S without worrying about your data being scattered around. And your private data will be perfectly protected. So don't hesitate to try one of them to remove the useless Spotlight Search from your iPhone. And if you have any problem about the methods or have other better ways to do the clean, please let us know. How to Clear Spotify Caches on iPhone/iPad? How to Erase Instagram Search History on iPhone? How to Erase or Wipe iPhone without iTunes?